With Manchester City on the same number of points but with a slightly inferior goal difference, going into the final game of the 1926/27 Division Two season Pompey needed to win and win well to ensure promotion into the top-flight. The Blues went 1-0 early on, but nerves were settled and promotion clinched with a 5-1 victory, which secured promotion by a 200th part of a goal (City had scored 8). At the end of the game Farmer's Boy Haines was carried off the pitch by adoring fans after notching four precious goals. The raw-boned Scot scored eight hat-tricks for Pompey in an illustrious career. The most important by far was the momentous one he notched against Aston Villa in the final game of the season. The 5-1 victory meant the Blues regained the Div One title by the narrowest of margins, pipping Wolves on goal difference. Club legend John Weddle played just four short of 400 games for the Blues and scored 183 goals in the process. His finest 90 minutes in a Pompey shirt came in the 1934 FA Cup semi-final where he banged in three against Leicester in front of a 66,000-strong crowd. Curly-top Kemp came in from Crystal Palace as an exchange which that saw veteran George Graham go the other way, and it was soon evident that the Blues had got the better part of the deal. His predatory hat-trick against Rotherham meant he was the first Pompey player to do so for seven years. Jolly Jack is a Pompey legend and one of his most emphatic games in the blue shirt was in the run up to the league championship in April 1949 when he bagged a hat-trick of headers in a 5-0 away win at St James’ Park in front of 60,000 Geordies. Jack scored his treble from the left wing, right winger Peter Harris scored the other two, remarkably both his goals were headers too. The former Barcelona and Real Madrid man did his single-handed best to deliver three points in the Div Two home game against Barnsley. Prosinecki’s treble included a superb solo goal plus a sweetly struck free-kick, but, sadly, his stunning hat-trick wasn’t enough and the Blues let a 4-2 lead slip. Bet he hit the cigarettes hard that night. On the Saturday Hateley claimed his first Pompey hat-trick with a penalty, courtesy of regular taker Kevin Dillon, in a commanding 5-0 win at the expenses Cambridge United. Four days later and he was once again adding to his matchball collection, this time it was Grimsby Town that bore the brunt of the sinewy striker’s mighty attacking force. The shock-haired striker blasted his way to a hat-trick at a fogbound Fratton against table-topping Lincoln City. The fog thickened towards the end of the game, but the result stood and Pompey rumbled on towards promotion. Pompey’s 7-4 victory against Steve Coppell’s Reading remains a Premier League record for the most goals scored in a single game. Future Pompey players Dave Kitson and Nicky Shorey (who also missed a penalty) both got on the scoresheet, but it was the man from Zimbabwe who took the honours. Macca always performed in the FA Cup for Pompey and this third round tie against Kenny Dalglish’s Rovers was no exception. His last-gasp leveller meant that the Premier League big boys would have to travel down south for a midweek replay (which they duly won). It was McLoughlin’s one and only career hat-trick. Kevin Dillon took Pompey through to the last 16 of the Full Members’ Cup with that rarest of feats, a hat-trick of penalties; he wasn’t called Deadeye Dillon for nothing, you know. A youthful Teddy Sheringham was in the Milwall team. 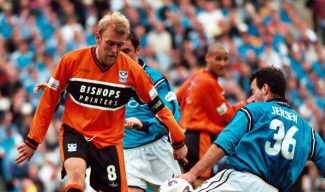 Talking of which, Sheringham’s expertly-taken second half treble against Sam Allardyce’s Bolton helped Pompey claim a convincing 4-0 victory under the lights at Fratton Park. The three points saw briefly sit at the top of the Premier League table. It was all downhill from there. Tricky Nicky wrote himself into the club’s record books as the youngest scorer of a hat-trick in a Pompey shirt with his treble away at Carrow Road. He was 21 years, 7 months, 30 days old. The popular left-winger went on to win the Player of the Season award that year.